Important direction of scientific work of the Khmelnytskyi Humanitarian-Pedagogical Academy is publication of collection of scientific works "Topical Questions of Artistic Pedagogics", founded in 2011. The collection is registered in the Ministry of Justice of Ukraine (certificate about state registration of the printed mass media (Series KB №19794-9594 Р of 25.02.2013). 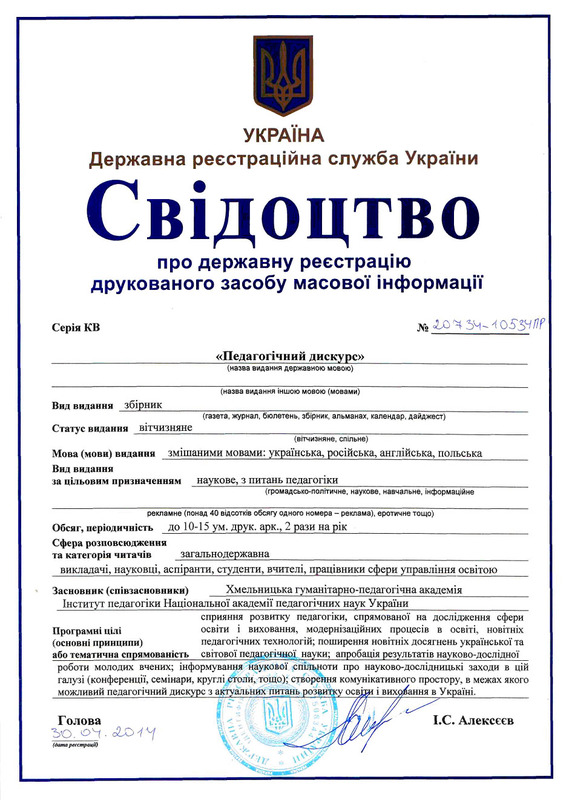 According to the order of the Ministry of education and science of Ukraine №1021 of October 7, 2015, the collection of scientific works “Topical Questions of Artistic Pedagogics” is included to the list of scientific professional editions of Ukraine, in which the results of scientific researches for obtaining scientific degrees of the candidate (doctor) of sciences in the sphere “Pedagogical sciences” can be published. The collection of scientific works “Topical Questions of Artistic Pedagogics” is awarded with the International standard serial number ISSN 2413-5402 Printed version). Collection of scientific works the "Topical Questions of Artistic Pedagogics" contains articles of theoretical and experimental character on the topical questions of theory and history of artistic pedagogics, prospects and directions of development of artistic competence of the future teachers, methodology and practice of teaching of artistic disciplines, introduction of innovative technologies in artistic education.